To remove grout haze from porcelain or ceramic tiles or grout haze that is less than 10 days old. 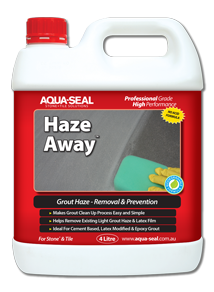 Haze Away™ is a non acidic problem solver formulated to simplify the grout clean up process by helping to prevent grouthaze from cement based, latex modified & epoxy grout. Helps prevent latex film from forming on stone & tile surfaces. Can also be used to remove existing grout haze & latex film within 10 days of grouting. USE: For encaustic tiles, ceramic tiles, porcelain tiles, tessellated tiles, natural stone. c) HEAVY HAZE: Dilute 1 part Haze Away to 1 part clean water or use neat. Note: Some areas may require longer dwell time and/or stronger solution. Note B: Do not use Haze Away on marble, limestone, travertine or on other acid-sensitive tile or stone. Note C: Use MicroScrub to remove grout haze from polished natural stone & acid sensitive surfaces – see Problem Solver #3.